Shri Mata Vaishno Devi - Situated at an altitude of 5,200 feet above sea level, the Holy Cave Shrine of Mata Vaishno Deviji or Trikuta Bhagwati has been a beacon of faith and fulfillment to millions of devotees from all over the world. The pilgrimage to the Shrine holds great significance to the pilgrims. The journey to the Holy Shrine of Shri Mata Vaishno Devi Ji starts with the Call from Mata. It is not only a belief but also a strong experience of one and all that the Divine Mother sends a call to her devotees. And once a person receives it, wherever he is, the visit to the Holy Shrine is bound to materialize to receive Her unbounded love and blessings. A popular slogan in the local folklore beautifully expresses it- Maan Aap Bulandi - which means that The Mother Herself Calls! It is also a matter of experience by almost all those who visit the Holy Shrine that upon the Call of Mata, a person needs to just take one step and leave the rest to Her and his journey gets completed with Her divine blessings. Simultaneously, it is also believed that unless there is a call or Bulawa no one can visit the Shrine or have Her blessings, irrespectiveof his position. Shiv Khori Cave Shrine - This holy cave is nearly a kilometre long and houses a 4 ft high, naturally formed ‘Shivling’. 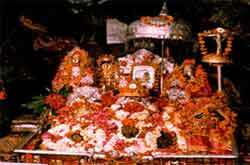 It is considered second only to the shrine of Mata Vaishno Devi in religious importance. There are stalactites and stalagmites dripping milky limestone water. To the left of Shivling Mata Parwati is symbolized by impression of Her Holy feet. Kartikeya is also seen in left of Shivlingam. At nearly 2.5 feet above, five headed Ganesha is can be seen. 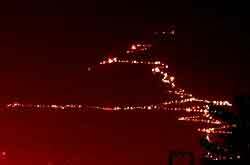 The Holy cave has a number of other natural images which are believed to be that of 33 crores Hindu Deities. 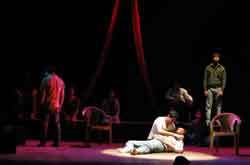 Shiv Khori Festival is celebrated on the eve of Maha Shivratri every year. Lakhs of pilgrims from different parts of the country visit this Holy Cave Shrine to seek blessings of Lord Shiva. Sudh Mahadev - Believed to be 2800 years old, the temple of Sudh Mahadev houses a natural black marble Lingam, the Trident (Trishul) of Lord Shiva and mace believed to be that of Bheema, one of the five legendary Pandava brothers. 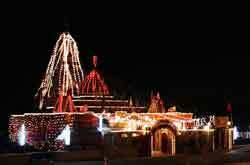 This holy temple near Patnitop is situated at an altitude of 1225 m and is about 120 kms from Jammu. Sudhmahadev has a spring by the name Pap Nashni Bowli. It is believed that taking bath in it relieves a devotee of all sins. After bath one proceeds towards the Holy Temple of Lord Shiva. Pilgrims visit the shrine on Historic Sudh Mahadev Festival (3 day Mela) on the full moon night of 'Sawan' (June -July) to worship the Trident (Trishul) and a mace. Mantalai - Another 8 kms from Sudh Mahadev is an enchanting Hill Resort of Mantalai. Located at the top of a hill and surrounded by tall Deodar trees giving fresh and cool air. It is believed that Lord Shiva and Goddess Parvati got married there. There is a Shiva temple with a pond by its side. Gauri Kund - Some distance short of Sudh Mahadev is the legendary spring where the Goddess Parvati used to bathe before commencing her daily prayers at Sudh Mahadev. A temple that was constructed at this spring came to be named after her as 'Gauri Kund' (Gaurikund). This picturesque spot is at a steep height from the main road that comes from Chenani town towards Sudh Mahav. Krimchi Temples - Krimchi, site of three of the oldest temples of Jammu, can be reached by taking a short detour of about 20 kms along a side road that branches off from the National Highway 1-A, about 8 kms short of Udhampur.Krimchi is the site of one of the oldest temple complexes of Jammu. Believed to have been constructed in the 11th - 12th century AD, this group of temples, also locally known as the Pandava Temples. The architecture of the temples shows distinct Greek (Hellenic) influences. Some distance further ahead in the hills is Pancheri, a beautiful hill resort. Baba Jittoo Temple - A Temple of Baba Jittoo in village Jhiri is located about 20 kms from Jammu, off the Jammu-Akhnoor highway. Baba Jittoo Temple is visited by a large number of devotees from Jammu & Kashmir as well as the neighboring states of northern India. Legend has it that the zamindar (a landowner, who leased his land to tenant farmer) demanded a major share of the wheat crop from Jit Mal, a poor farmer. Since the peasant had toiled hard to cultivate the crop he did not want to yield to this unjust and oppressive demand of the zamindar. Rather than parting with his crop, Jit Mal preferred to take the extreme step of ending his life over the heap of wheat. He has since been venerated as Baba Jittoo and is revered for standing up against the injustice and unfair treatment meted out to the peasantry during the feudal times. An Annual Jhiri Mela (festival/ fair) is organised every year during the Karthik Purnima (Late autumn full moon) falling during the last week of October and early November when an Annual Jhiri Mela (festival/ fair) to commemorate the martyrdom of Baba Jittoo. 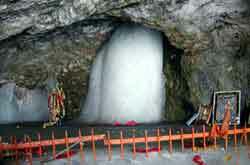 Shri Budha Amarnath Temple - Buddha Amarnath Temple is an ancient Shiva temple located at the confluence of two streams - the Nallah Gagri and the Pulstaya Nallah. The people believe that Ravan’s grandfather Pulasta Rishi performed his tapasya here and had a darshan of Lord Shiva. 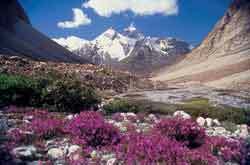 Budha Amarnathji Yatra traditionally follows the route from Jammu to Rajouri and then to Poonch. Pilgrims to Budha Amarnathji Yatra are treated as respectable guests by the organizing committee and the district administration of Poonch in Jammu & Kashmir. Irrespective of religion and region all Yatris are provided every possible help to facilitate in performing pilgrimage in a conducive atmosphere. Kailash Kund - A Journey to Eternal Faith - Abode of the mythological serpent God, Lord Vasukinag Ji, the sacred Kailash Kund, located at 16000ft above sea level in Doda District of Jammu and Kashmir, is an enchanted crater lake which remains frozen for a greater part of the year. During late August or early September every year the scenic environs of this hallowed lake come alive to the chants of thousands of devotees who undertake an arduous trek to take a Holy dip in the lake during the annual Kailash Yatra. Believed to be as Holy as the sacred Mansarover lake in China, a dip in the ice-cold waters of Kailash Kund is believed to wash away the sins of the yatries (pilgrims) and make their wishes come true. Legend has it that the lake is also visited by Lord Shiva who described it to Mata Parvati as one of the most important pilgrimages of Northern India in the 'Vasuki Puran'. 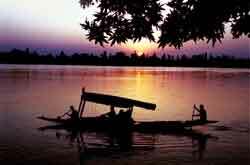 The yatries, while taking the Holy dip, also worship the Lake, Lord Shiva and Sh. Vasukinag Ji. Purmandal Temple - About 40 kms from Jammu, just off the national highway towards Pathankot, is the Purmandal Temple Complex on the banks of the sacred and mostly underground Devak river. Often referred to as 'Chhota Kashi', its main Temple is dedicated to 'Umapati', while the other temples are dedicated to Lord Shiva where Shiv lingams are believed to have originated naturally. People come from India and abroad to worship Lord Shiva and Goddess Parvati here. It is believed that their prayers are converted into blessings here so they can lead a happy and prosperous life. The devotees gather here for a three day Purmandal Mela (fair/ festival), in the month of February every year to celebrate the marriage of Lord Shiva and Goddess Parvati.